This focus is on the early years of the Rahway Valley Railroad, how the actual RV came into existence, and how both of its predecessors failed. Originally, the RV was to play a role in the grand scheme called "New Orange." 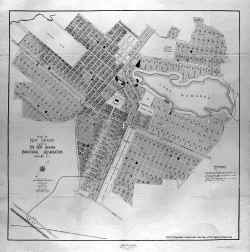 In 1894 several associates met in Elmira, NY to discuss the idea of building a model city in what is now Kenilworth, NJ. Some of the associates included Charles Wright, C. W. Manahan Jr., Harry Dankel, Robert Grimes, W. S. McCord, and Charles Tompkins. Manahan was the one who proposed the idea, and was its main promoter. The associates called their project, "New Orange," and in turn formed the New Orange Industrial Association (NOIA). The NOIA acquired a total of three and half square miles of land in the area where they wanted to build. Their main reason for choosing this spot was the lack of mosquitoes and malaria. A man named J. Wallace Higgins was hired to design a plan for the project. 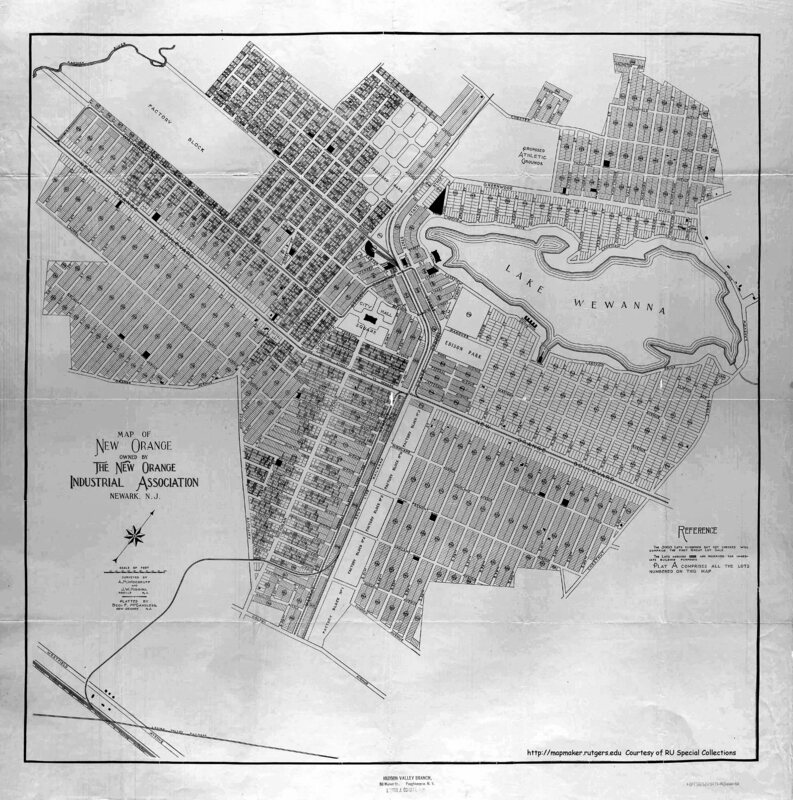 The overall plan included a fresh water lake to be built with islands in it, called Lake Wewanna, a trolley line, a grand city hall, a yacht club, parks, casinos, a theatre, space for six factories, enough housing for 60,000 people, and of coarse a railroad, entitled the "Belt Line Railroad" based on Higgin's plan. By 1896 much had been accomplished. Four factories had been built, called the "Big Four" they were, the Circular Loom Corporation, Ricca Manufacturing Company, New Orange Decorative Leather Company, and the Charles E. Wright Company. All specialized in something relating to clothing. Products were originally hauled the two miles to the Central Railroad of New Jersey in Roselle Park by horse. By the year 1896 the NOIA had accumulated a net worth of over six million dollars. Also by this time the NOIA had accumulated much debt in mortgages. The NOIA finally got started on its railroad to haul passengers and the products of its factories. 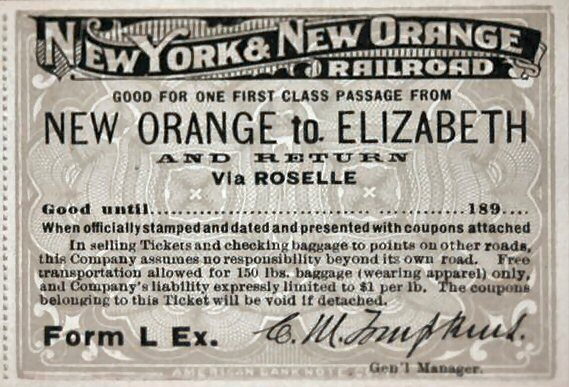 On June 11, 1897 articles of incorporation were forwarded to the state capital for the formation of the New York and New Orange Railroad. 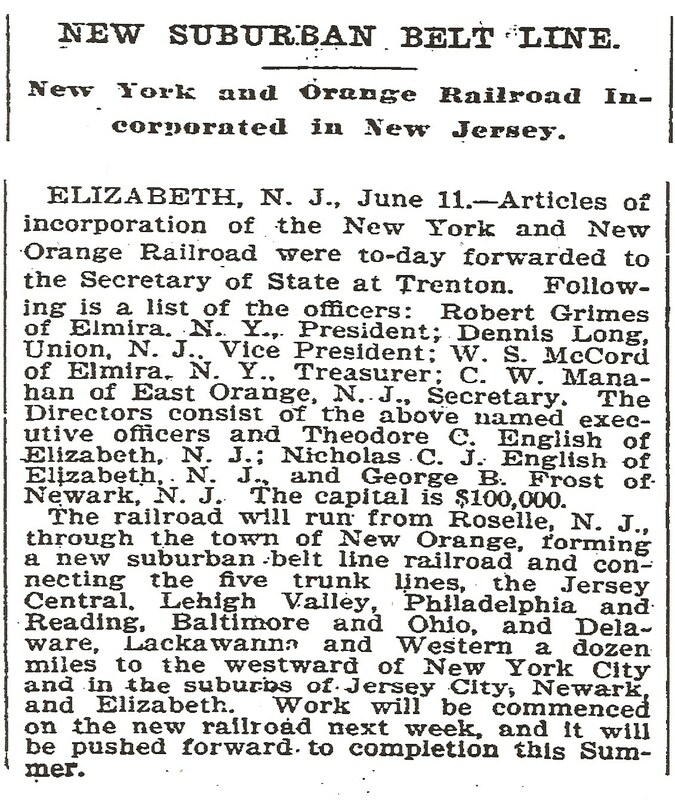 The original officers of the railroad were, Robert Grimes of Elmira, NY, President; Dennis Long of Union, NJ, Vice President; W. S. McCord of Elmira, NY, Treasurer; C. W. Manahan of East Orange, Secretary; additional stockholders were brothers Theodore C. and Nicholas C. J. English of Elizabeth; and George B. Frost of Newark, NJ. The initial capital invested in the railroad was $100,000. The directors plan for the railroad was to have the railroad run out of New York City to Jersey City, Newark, Elizabeth, and to Roselle Park, and up to Summit, connecting with the Delaware Lackawanna and Western, the Central Railroad of New Jersey, the Lehigh Valley, the Baltimore and Ohio, the Reading, the possibly the Pennsylvania. The charter approved only allowed for a seven mile line from Roselle Park to Summit. The fact that the associates planned for the railroad to go into New York City might tell us why "New York" is in the railroad's name. Higgin's plan for the railroad in the model city of New Orange was to have a grand central station on what was to be known as State St., which today would be opposite the tracks from Michigan Ave., where the Monsanto Branch separated from the Mainline. There was to be a large rail yard of six tracks, and a round house of eleven stalls. There was to be a short street running branch line to a large factory yet to be built, this later became the Monsanto Branch. He also planned the route of the line to Summit. Construction of the railroad started that summer of 1897 and continued to February, 1898, when the first two miles were completed from New Orange to Roselle Park and the line connected to the Jersey Central. 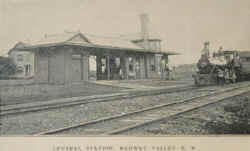 The station at New Orange, which was only to be temporary was constructed north of the "Big Four" factories and was completed in 1898. 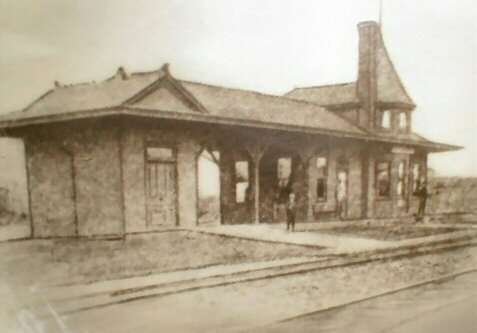 Another station was built called "Warren Street Station," and a small roundhouse of three stalls was built across the tracks from this station, and it stood until 1911. Also in 1898 the NY&NO's first locomotive arrived at the junction with the Jersey Central. The ancient locomotive was purchased for next to nothing from the Northern Central Railway in inoperable condition. Duane Kimball, an engineer on the Jersey Central was hired to ready the locomotive for service. He did this on a siding at Roselle Park (Aldene Junction.) The 4-4-0 American Type locomotive was built sometime in the late 1860s and was nearing age 40. While on the siding at Aldene it was painted with "N.Y. & N.O." on the side, was named "New Orange," and was numbered 1. When the locomotive was completed it pulled into New Orange for the first time blowing its whistle and ringing its bell, and a crowd gathered to welcome its town's first "Iron Horse." 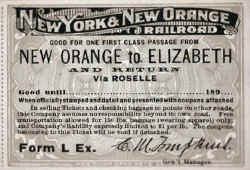 Two passenger coaches were purchased secondhand in 1898 from the Jersey Central, to shuttle passengers on the two mile line between New Orange and Aldene. After all the hype in 1898, things went south in 1899. An industrial depression in the year 1899 caused the four factories in New Orange to be closed during 1899 and 1900. Only light passenger service was done on the line that year. 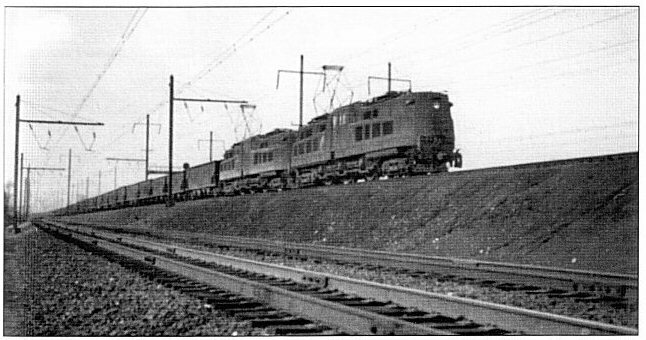 Nos.1-3 were therefore used infrequently, and only used to pull the passenger trains to the CRRNJ. (No.2 is arriving in this view). For the entire year of 1900 the NY&NO made a total of $562.98. Also that year the railroad reported a total debt of $38,000. It was at this time that the railroad stopped paying taxes. Also invested stock in the railroad fell to $50,000. The railroad came under the possession of the Union County Sheriff in January, 1901. After the sheriff took possession of the NY&NO some directors scurried to organize another company to take over the railroad. 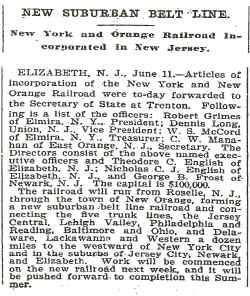 Headed by hot headed, former NY&NO president, William W. Cole, the New Orange Four Junction Railroad was organized on February 4, 1901 with initial capital stock of $125,000. The NOFJ purchased the NY&NO at public auction in February, 1901. And began Cole's great try at getting the railroad "on track." Cole had ancient NY&NO locomotive scrapped and two "new" locomotives were purchased from the Lehigh Valley Railroad, both of 1880s vintage, and of the 4-4-0 wheel arrangement. Both of the old NY&NO passenger coaches were kept in service, and an additional combination coach was added to the passenger coach roster. Cole thought it was in the NOFJ's best interest to have a connection to a second railroad. He had the half mile long "Lehigh Valley Branch" built to the Lehigh Valley Railroad. The only thing standing in Cole's way was the huge amount of debt left over from the New York and New Orange Railroad, which Cole could never seem to shake off of his company's books. Cole wanted to extend the NOFJ to Summit, which was called for in the original charter. He got the attention of the Pennsylvania Railroad which purchased some stock. In 1902 a survey was made for a line to Summit. The Pennsylvania Railroad sought to acquire the line and extend it south to connect to its mainline, and expand it further. It was at this time that the railroad caught the attention of Louis Keller, and became involved in the project of extending the line. Keller, founder of the Baltusrol Golf Club, wanted a rail line built to his club. Right of ways were acquired to Summit and an article was published in the New York Times entitled "TO BUILD NEW RAILROAD." Things seemed well on the outside, but left over debt from the NY&NO and more debt was starting to doom all prospects. Tin Kettle Hill Archive: Mary McCory In 1903 the Pennsylvania Railroad acquired Tin Kettle Hill, along the NOFJ. 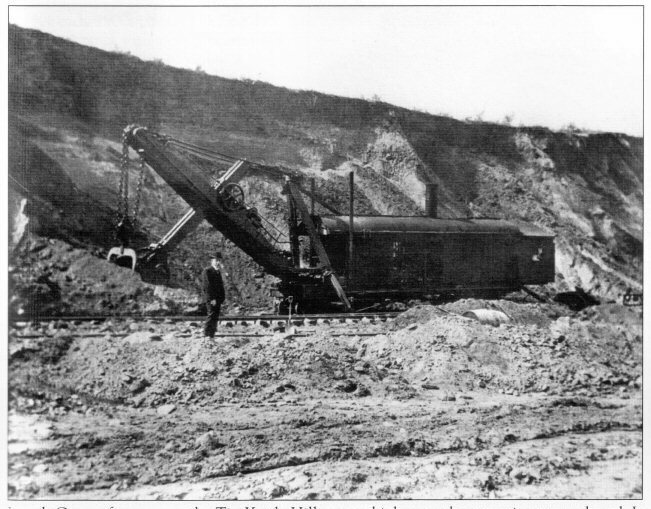 The NOFJ was contracted to have the soil of the hill removed for the PRR's approach to their NYC Tunnel. 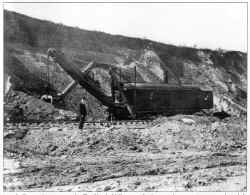 Steam shovels that previously worked on the first Panama Canal project were acquired and thousands of carloads of soil left the NOFJ every year. Debt still loomed over the NOFJ, and the extension to Summit seemed all but dead come early 1904. Then came the Cross Steam and Electric Company (CS&E), which chartered a subsidiary, the Cross Country Railroad, to run from a connection with the NOFJ to Summit, and a branch through Millburn to Maplewood. Louis Keller backed this project and signed the application to build the CCRR. The CS&E Co. gave up on the Cross Country Railroad in March, 1904, only a few months after it had been proposed. It was this that set the fire under Louis Keller to incorporate the Rahway Valley Railroad on July 18, 1904, and eventually acquire the 3.5 mile long NOFJ on March 1, 1905, after W.W. Cole had finally thrown in the towel. It was Keller who finally got the line to Summit in 1906. As for the NOIA it eventually failed in 1907, after several of the original members had died, and it became Kenilworth Realty Group, playing a small role in the town, eventually fading into oblivion. The "Big Four" were eventually shut down, and torn down.